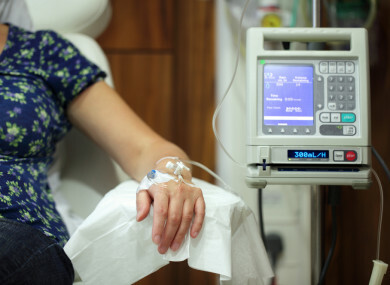 The Irish Cancer Society has called for the abolition of inpatient fees in the next Budget. THE IRISH CANCER Society is calling on the government to abolish inpatient charges in Budget 2019. Patients are required to pay €80 for an inpatient visits, including day cases for cancer treatments such as chemotherapy. “Inpatient charges of up to €800 a year can be crippling for families struggling to make ends meet while also trying to cope with the physical and emotional impact of cancer,” said Averil Power, CEO of the Irish Cancer Society, which has launched a petition calling for the abolition of these fees. “If patient charges aren’t paid within seven weeks, they can be referred to a debt collection agency by the hospital. This practice causes needless stress and fear for patients and must be stopped. It is the last thing any patient needs while having treatment for cancer,” she said. Marie Moran, who is a breast cancer survivor, was diagnosed when she was 32 weeks pregnant. “The first I knew of inpatient charges was when the bills arrived,” she said. I was in the process of applying for a medical card so in the hope that it would come through, I didn’t pay the charges. When the bills turned into final notices it caused me so much stress and worry at an already difficult time. Eventually the hospital agreed to waive the charges, however I still received a couple of chase up letters demanding payment which was really upsetting and stressful. Email “'I didn't need that additional fear': Hospital debt collectors 'causing stress' to cancer patients”. Feedback on “'I didn't need that additional fear': Hospital debt collectors 'causing stress' to cancer patients”.